With Yom Kippur around the corner Shtetl speaks with Daniel Sieradski. 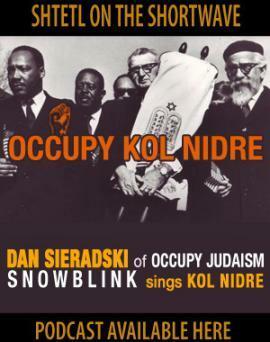 A leading figure in Jewish activism and media, Sieradski is the heart and brains behind the Jewish response to Occupy Wallstreet: Occupy Judaism. Sieradski gives Shtetl his last media interview and explains why he is leaving Jewish public life- but not before coming to LeMood on October 14th. Also, tune in for our yearly get together with pop star and cantor Daniela Gesundheit of Snowblink fame. Snowblink plays POP Montreal this weekend, but they probably won’t be doing the Kol Nidre so tune in to Shtetl to hear a beautiful rendition of this most stirring prayer. Plus lots of great tunes for your pre-Day-of -Atonement pleasure. Listen back to the archive on the Shtetl blog, or download from iTunes.